Timing the stock market can’t be simpler than this. You probably already know about the concept of ‘percent above moving average’ and how it can pin point inflection points. Here’s a great way to use that concept applied to a very, very narrow subset of the market: the Dow Jones Industrial Average. Eventhough we’re only talking about 30 stocks out of the thousands traded on stock markets in the US, this group of stocks is so important that their behaviour can accurately reflect the mood of the whole market. And calculating this is so easy, you can do it yourself on the back of a scrap piece of paper. Just scan through the 30 stocks and see how many are above/below their 50 day moving average. Take those that are above and divide by 30. If the number is low (30% and lower) you should not be pressing a short bias or position in the market. If you do, chances are that you’ll get whacked in the face by a snap back rally. As you can see, it has a very good track record. It caught every single important inflection point (including the April 2005 bounce which I forgot to annotate). The only exception I can find is the October 2005 example. But even then, it almost kissed the 25% line. Think of price as stretching against the moving average like a dog pulling away from its handler. In the short term, a dog can pull away from the intended direction of its master but it is only a matter of time that it comes back and rejoins her. In the market, the ‘master’ is the major direction of the market. As long as we know the major trend, we can easier identify short term fluctuations around it. An important caveat is to not try and flip this around to find tops. Usually tops are notoriously difficult to sniff out for any indicator. So that isn’t a particular knock on this one. 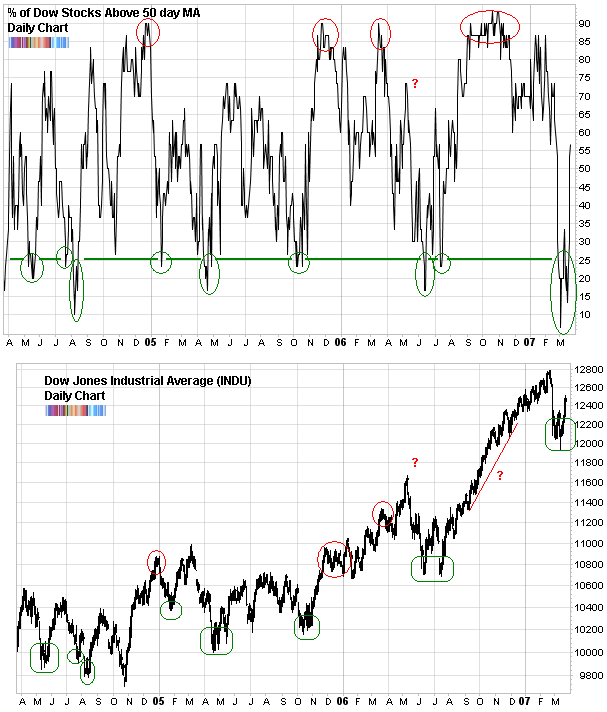 It totally missed the May 2006 top and it mis-identified September - November 2006 as a top when in fact the index was on a beautiful trend upwards. Have you tested this theory for 2000 and 2001? In up years this should work well. In down years you will find that the reverse is correct. In other words, you will be able to predict tops and not bottoms. Disclosure: Opinion of CrossProfit analyst, may not reflect opinion of CrossProfit.com. CP: Thanks for pointing that out. Do you have a graph of the indicator for those years or is it your suspicion that it would be reversed? Great post, I think this can be utilize in tandem with Dr. Brett’s Relative Volume Flow, keep it up. does this also mean that above 70% means get short (or at least out of long positions)? can’t see why it wouldn’t. it is not a timing tool. Next week should be another exciting adventure.